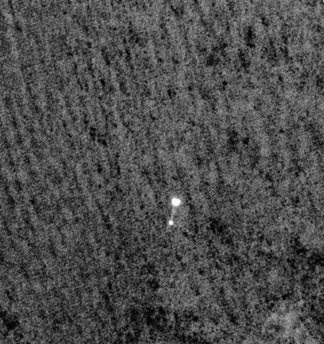 Over the weekend, NASA's Phoenix lander successfully touched down on the arctic plains of Mars. At left is an artist's depiction of how the landing may have looked. We're used to artists' depictions. There were NASA-provided animations of stage separations and, later, landings back when Walter Cronkite and Jules Bergman were holding up plastic models in front of the camera to illustrate their points. 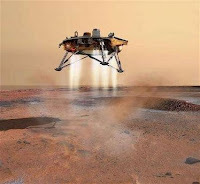 This is no artist's depiction: This is an actual photograph of the Phoenix lander descending toward the Martian surface, an image captured from Martian orbit by a different satellite. 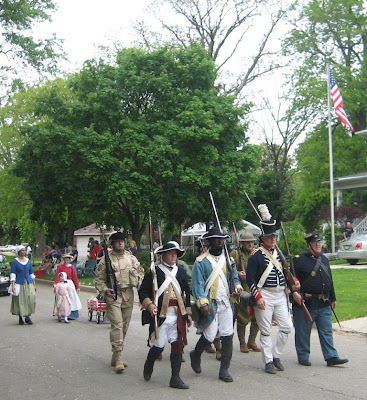 Scenes from today's Norwood Park Memorial Day Parade. 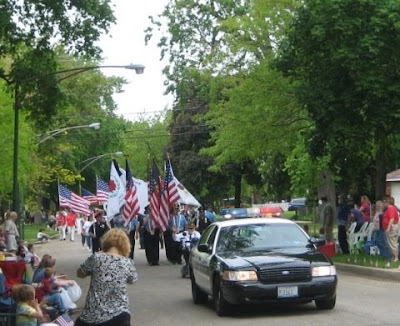 There's probably a story behind how the Rosemont Police came to provide the honor guard for this Chicago neighborhood parade... but I don't know it. 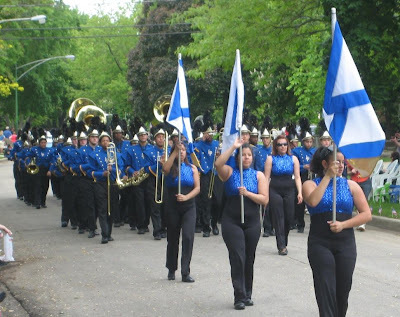 And what's a parade without bands? Here's the Lincoln Park High School Band. The band stopped to salute the Eshoo home. 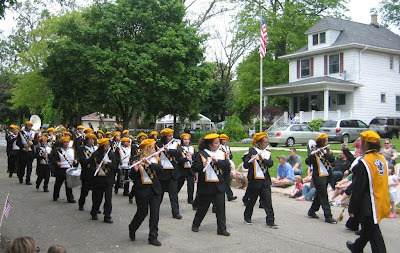 This is the band from Kelvyn Park High School. 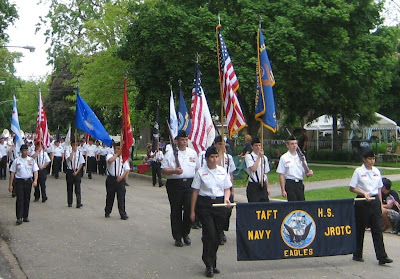 Taft High School was represented by its Junior Naval Officers Reserve Officers Training Corps. 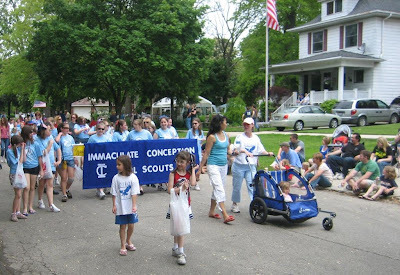 And it wouldn't be a Memorial Day Parade without plenty of Scout groups. 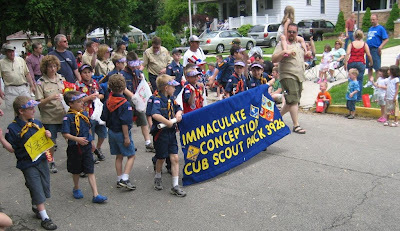 These are Cub Scouts from Immaculate Conception Grade School, but every neighborhood school was represented. 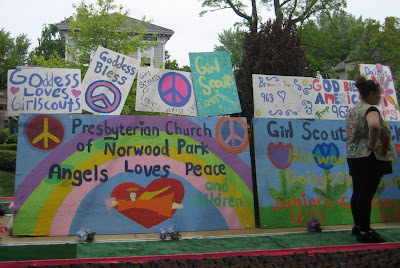 This was a float offered by the Girl Scout group from the Presbyterian Church of Norwood Park. 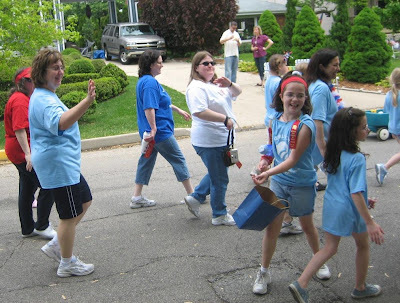 These are the Girl Scouts from Immaculate Conception Parish. 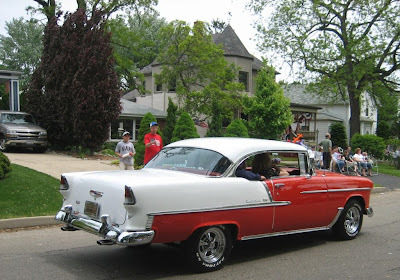 And then came the antique cars. Lots and lots of cars. 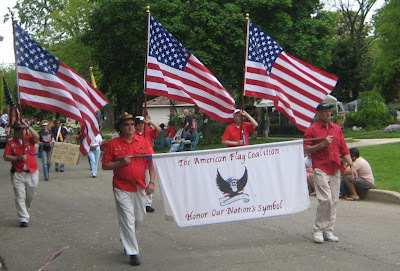 For more parade photos, see this post on page two. Karen M. Wilson has been selected as an Associate Judge for the 18th Judicial Circuit (DuPage County), the Administrative Office of the Illinois Courts has announced. Wilson is a 1987 graduate of the University of Wisconsin. She received her law degree in 1991 from DePaul University in Chicago. Wilson has been most recently affiliated with Smith, Rickert & Smith, a firm with offices in Downers Grove and River Grove. According to the Smith, Rickert website, Wilson also worked as a DuPage County Assistant State's Attorney for eight years. David Cook is surprise winner on "Idol"
But only because the votes in Michigan and Florida weren't counted. Many Chicagoans know that Lincoln Park was once a cemetery. Most, probably, don't know that it still is. 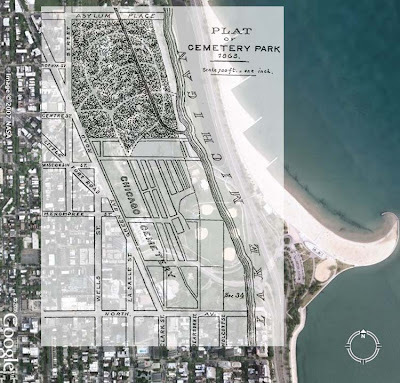 Pamela Bannos, a senior lecturer at Northwestern University, has explored the transition of the Chicago City Cemetery into today's Lincoln Park and her findings are published, on the Internet, as the "Hidden Truths" project. In today's Chicago Tribune Robert Mitchum reports about the project and, in particular, how today Bannos "will place six historical markers at significant sites around the park, like the Couch Tomb, a huge mausoleum too expensive for the city to relocate, and Potter's Field, the burial ground for the city's poor that now lies beneath the baseball fields along LaSalle Drive." The Couch Tomb is not the only gravesite that wasn't moved. Whether because of incomplete record keeping or because of the loss of records in that unfortunate incident with Mrs. O'Leary's cow (or Pegleg Sullivan, depending on who you talk to these days), it appears that many bodies were not relocated. One page on Ms. Bannos' site documents where bodies have turned up unexpectedly. (Run your mouse over the yellow dots on the linked map to see details.) The Tribune article says that Bannos' work shows that the remains of as many as 12,000 Chicagoans may still lie beneath today's park. It is not known how many of them still vote. Map & photo combination obtained from the Hidden Truths website. I remain skeptical. But rather than try and explain again what makes me nervous about Facebook, let me direct you to this very funny, if a tad rude, video I've posted on Page 2. Bank of America finished its digestion of LaSalle Bank this week. 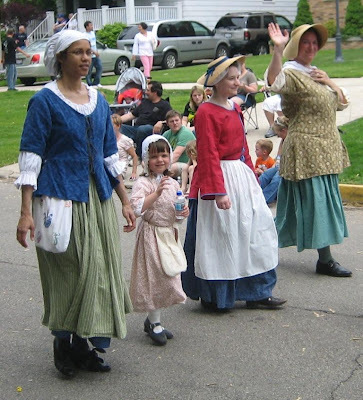 The Dutch company (ABN AMRO) that bought out LaSalle Bank in the early 90's -- and thereafter swallowed up other Chicago institutions like Talman-Home Savings and Bell Federal Savings -- sold LaSalle to Bank of America. That's the Charlotte, North Carolina-based Bank of America, y'all. Bank of America says it wants to be involved in Chicago, and, for starters, it has assumed sponsorship of the Chicago Marathon. So that's encouraging. 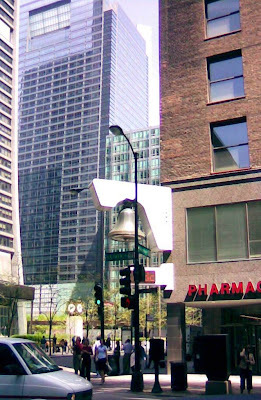 But do not ask for whom the Bell tolls (at the Weather Bell corner, Monroe and Clark)... it tolls for thee, local ownership. A Chicago attorney is seeking to vacate a discovery sanction of more than $29,000 by U.S. District Judge Eduardo C. Robreno of Philadelphia. And, in light of the sanctions, the attorney, Joseph Ziccardi, is also seeking to withdraw from his representation of Aaron Wider, the CEO of HTFC Corp.
Wider apparently made a shambles of his deposition. Over 12 hours of testimony, on two different days, Wider 'dropped the F-bomb' 73 times and was, according to the sanctions order, otherwise hostile and uncooperative. Ziccardi is faulted by the court for failing to rein his client in or, if that proved impossible, failing to adjourn the deposition. Debra Cassens Weiss also has a post about this on ABAJournal.com. I saw a reference to this story earlier this week in the print edition of the ABA Journal. Read the entire lengthy order imposing sanctions here. Usually, lawyers are cautioned against coaching their witnesses in depositions; the witness is supposed to testify, not the lawyer. But this was apparently a case where the witness wasn't testifying -- and the court determined that the lawyer should not sit idly by while the client berated and abused his interrogator. The court found that the lawyer's failure to attempt to assert control made the lawyer complicit in the client's out-of-control conduct. Martha Neil reports in a May 6 article on ABAJournal.com about Deborah Griffin, a Philadelphia municipal judge, who has been removed from office because of an old criminal conviction. Read the Pennsylvania Supreme Court opinion here. When she applied for admission to the Pennsylvania bar in 1988, Griffin failed to disclose that she'd pled guilty two counts of a federal indictment charging her with using a false social security number in a number of credit card applications and on an employment application. She did no jail time as a result of these convictions, but she did receive probation and she was ordered to pay restitution. Griffin's failure to disclose this conviction led to her being suspended from the practice of law in 1994 (Office of Disciplinary Counsel v. Griffin, 535 Pa. 590). Griffin was subsequently reinstated to the bar and then, in 2001, elected to the bench. She was retained for a second six year term in a November 2007 municipal election. In the linked opinion, Pennsylvania's highest court removed Judge Griffin from the bench because it found her 1984 conviction to be for an "infamous crime" under Article II, Section 7 of the Pennsylvania Constitution, which provides, "No person hereafter convicted of embezzlement of public moneys, bribery, perjury or other infamous crime, shall be eligible to the General Assembly, or capable of holding any office of trust or profit in this Commonwealth." The current ABAJournal.com article and a March 5 post by Debra Cassens Weiss report that Griffin claimed that she'd not disclosed her conviction in her original bar application because she thought her "record had been expunged." After her law license was suspended, though, she presumably knew that this was not the case. Nor do I know whether the convictions to which Griffin pled guilty could have been expunged or, if so, under what circumstances. Nothing in the ABAJournal.com stories, or in the published court opinion, or in the AP account of the matter indicates whether Griffin ever sought a pardon. This is a reprint, with the author's permission, of an article by Lee Goodman that I saw in Monday evening's Law Bulletin. Goodman is the president of Professional Education Resource Corporation, which offers approved Illinois MCLE courses online at mentorCLE.com. A bit of confusion has arisen about the new Illinois MCLE requirements. This is not surprising, considering this is the first year that Illinois lawyers will be required to comply with all the new rules governing MCLE. Nevertheless, attorneys need to understand the rules, because failure to comply with the rules can have serious consequences, including the possible loss of one’s law license. This article answers ten of the questions attorneys ask most frequently about the MCLE rules. Q) How many ethics courses do I have to take? A) You do not have to take any ethics courses. You only have to take four hours of “professionalism” courses, which can cover topics such as diversity, Alternative Dispute Resolution, law practice management, and other topics, including ethics. Q) So I need four hours of professionalism credits? A) You need at least four hours of professionalism, but all 20 of your hours can be professionalism courses if you want, or any number between 4 and 20. Q) Can I get credit for in-house training at my law firm? A) You can get credit for some in-house training, but each training session must be individually registered and approved by the MCLE board. The mere fact that your firm may have registered as an “approved provider” is not sufficient. Q) Can I take a course more than once? A) There is no limit on how many times you can get credit for taking the same course, but you must wait 12 months between each time you take a course if you want to get credit for it more than once. A) No. The term “approved providers” is misleading. It mostly has to do with how long the provider has been in business. What is important is whether the course is approved, not whether the provider is. You can get credit for courses that are offered by providers that are not “approved providers”, so long as the courses have been individually approved by the MCLE board. Note: The MCLE Board’s website lists courses by the date they were originally approved. Courses that are offered multiple times, including online and recorded courses, can be approved for multiple years, so you may have to look for them in lists from prior years. If you have any questions about whether a course has been approved, the MCLE board recommends that you contact the course provider. Q) Do all of the courses offered by “approved providers” comply with the Illinois MCLE rules? A) No. Some of these providers are offering courses that may not meet the requirements of the Illinois MCLE Board. Courses offered by “approved providers” are only presumptively approved, and they may not actually qualify for credit. This applies both to “approved providers” that are located outside Illinois and those that are based here. Make sure every course has been individually approved or meets the requirements for approval. Q) Can I get credit for self-study? A) Yes. For example, you can take all of your courses online or on pre-recorded tapes. You cannot, however, get any credit for reading law reviews, books, articles, courses, or any other written material. Q) How else can I get credits? A) You can get credit for writing published articles and for certain types of teaching. But be careful – the rules are a bit tricky, and they are not obvious. For example, you can get credit for teaching at a law school if you are a part-time faculty member, but not if you are full-time. And you cannot get credit for giving a speech at a law school. Q) What if I have more credits than I need? A) You can carry over excess credits into the next two-year reporting period. Up to a maximum of 10 hours can be carried over from one reporting period into the next. No professionalism credits can be carried forward to satisfy the professionalism requirement, but they can be carried over as general credits. Q What happens if I don’t get my credits on time? A) If you miss the deadline for getting your credits, you have to pay a late fee to the MCLE board. The fee starts at $100 and goes up the longer you wait. If you wait too long, you can lose your law license. If this happens, your malpractice insurance may lapse. Even if you later get your credits and have your license restored, there may be a gap in your insurance coverage. In addition, if you lose your license, you cannot be listed as “of counsel” to a firm. You may also be disqualified from doing other work, such as serving as an arbitrator in mandatory arbitration. The MCLE rules may seem a bit confusing at first, but Illinois’ MCLE rules allow attorneys many options, so it should be relatively easy to find a way to get the credits you need. A very broad range of courses are permitted both for general and professionalism credits, so lawyers should be able to find courses that are of interest to them, either in areas they practice in or in areas they would like to learn about. Lawyers are also allowed to take courses that are presented in a number of different ways, such as recorded video and online courses. This is particularly helpful to attorneys whose schedules make it difficult for them to attend live seminars or who might live in areas where few seminars are available. And the MCLE Board has made allowed a large number of providers to offer courses, so a great selection of courses is available. Judge Pearson sues the pants off Washington D.C. Speaking of "frivolous" lawsuits, you may remember Judge Roy Pearson, the Washington, D.C. administrative law judge who filed suit when a dry cleaners in his neighborhood lost the pants to his $1,100 suit. His suit demanded $67 million for the lost pair of pants -- later reduced to $54 million -- and the outrageous nature of these demands, coming as they did from someone in judicial office, sparked national publicity, fanned by 'tort reform' groups. The hostile publicity got truly shrill and impassioned when it was revealed that Judge Pearson turned down a $12,000 settlement offer from the Korean family that ran the dry cleaners. Less well publicized, of course, was the outcome of such a ridiculous suit. Late last June, District of Columbia Superior Court Judge Judith Bartnoff entered the following order: "Plaintiff Roy L. Pearson, Jr. takes nothing from the defendants, and defendants Soo Chung, Jin Nam Chung and Ki Y. Chung are awarded the costs of this action against the plaintiff Roy L. Pearson, Jr."
And Judge Pearson lost twice: Around the time he lost his suit against the cleaners, he also lost his job. He was not reappointed to his District of Columbia post. And now Judge Pearson is back in the news: He's sued to get his job back. And guess who's calling attention to his latest legal maneuvers? The linked story on CNN.com quotes Darren McKinney of the American Tort Reform Association -- not Pearson, the alleged subject of the story -- of whom McKinney says, "He lost his job because he proved he did not have the legal requirements to fill the job, namely a judicial temperament." The CNN story isn't about a man who may have issues over and above losing his job. It's about scaring the public into believing that we are suffering an epidemic of "frivolous" lawsuits. The public identifies, understandably, with the Korean family working hard to build a business -- and fears that their business or their homes or their savings may be next to be wiped out by a "frivolous" lawsuit. We bought the blue bags at Casa Leyhane; we used them. We put them out faithfully each week and watched the massive gears smash and grind our fragile blue bags in with the coffee grounds and food scraps and all the other household garbage. I wanted so hard to believe that, somehow, our recyclables were really reclaimed from the waste stream. I clapped and clapped and clapped, hoping that Tinkerbell would make it. But I can not really claim surprise that the City of Chicago has just bagged the blue bag program. And -- here in the 41st Ward -- what has the City replaced the blue bag program with? Nothing. 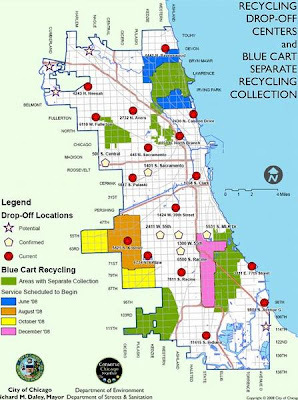 As the map shows, some areas of the City will be receiving "blue carts" that will be picked up by separate trucks every two weeks. A few areas already have them. 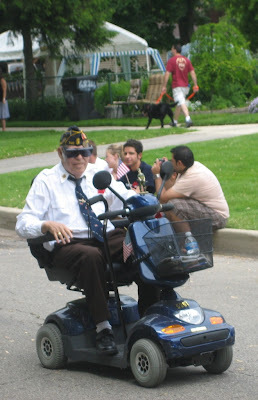 But there's not even -- you should pardon the expression -- a roll-out date set for the 41st Ward. And what should we do in the meantime? In the linked Tribune article, Laurie Cohen and Kristen Kridel report that Streets and Sanitation spokesman Matt Smith says that if residents "still choose to put their recyclables in blue bags, the city's private waste contractors will be required to recycle the contents." 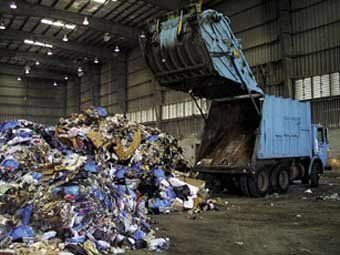 On the other hand, according to the same Tribune article, "city officials said that within three months, they will end their contracts with Allied Waste Transportation, the politically connected company that has operated the sorting centers since 2003." I can't clap any more. 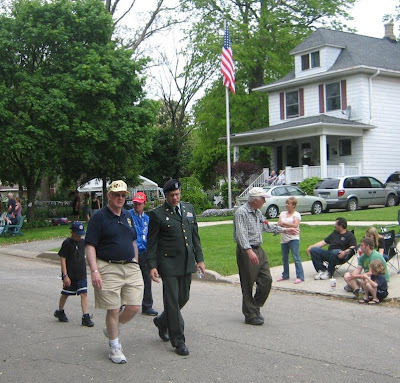 Years ago, the 41st Ward was used as the proving grounds for a "blue bin" recycling program, similar to one that many suburbs have used. Glass and plastics and aluminum -- or at least the little aluminum that escaped the attention of foragers who were engaged in their own private recycling programs -- were collected on a separate truck. Compliance rates were high. Residents could see whether their neighbors were putting recyclable stuff in the open blue bins as they walked down the streets -- there aren't as many alley pickups here in 41 as there are in other wards -- and peer pressure helped ensure greater compliance. So we proved that urban residents could and would recycle... and then we got the blue bags. The map shows centers where recyclables may now be delivered, if you want to burn your own gasoline at $4 a gallon to take them. Many schools and churches already have paper or other recyclable collections. And it appears that -- maybe -- the City has finally opened a place to accept (and responsibly dispose of) used computer equipment, video players, printers and other electronics (ecycling, it's called). The Chicago Recycling Coalition provides a link to this page on the City of Chicago website. Clicking through the linked City site -- you didn't expect they'd come right out and tell people where this facility is, would you? -- the ecycling facility is at 1150 N. North Branch Street (two blocks east of the Kennedy Expressway at Division Street). The limited hours at this facility have not yet coincided with my schedule. So I can't verify that this operation really exists. And I certainly can't promise that the City is really disposing responsibly of items that may be brought there -- although there are valuable materials that could and should be extracted from used electronics in particular. There's not enough of anything in your old VCR to take to a jeweler -- but put a few thousand of them together and there should be. So I don't know if this is legit -- but I so want to believe. I'll report back when I have the opportunity to check it out personally. There's a mock obituary for the blue bag program at Clout City, but I first saw this story at The Sixth Ward. What is a "soft tissue" case anyway? That's one question. 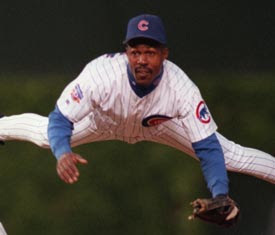 But you might ask first -- why is former Cub shortstop Shawon Dunston prominently featured here on the blog of an alleged White Sox fan? I can tie this up, Your Honor, if you'll give me a moment. You see, I seem to recall that Shawon Dunston went on the disabled list once, several seasons back, because, he said, he threw out his back putting an infant car seat in his car. The point is that odd, weird, nagging injuries can happen to anyone -- and sometimes do -- with seemingly little provocation. And, sometimes, that little provocation that leads to an odd, weird, nagging -- and painful and lingering -- injury is a little "fender bender" auto accident. Injury does not always result from a "fender bender" -- and thank heavens this is so. Everyone who's ever driven (or been a passenger) in an automobile for any length of time is likely to have been involved in one or more of these. If these types of collisions always resulted in injury, or even if they frequently resulted in injury, we'd be a nation in neck braces. But real, serious injury can result -- sometimes -- on occasion -- from a very minor accident. These are often called "soft tissue" injuries -- where there are no bone fractures (bones, presumably, being "hard tissues"). I will concede that serious injuries don't result as often as claimed from minor automobile collisions. "Soft tissue" cases have acquired an unsavory reputation -- and deservedly so -- because so many cases seem to have damage claims inflated entirely out of proportion to any plausible injury. Many "soft tissue," low impact auto cases seem to be cut from the same suspicious cloth. The medical bills aren't paid (see previous post) and even the choice of providers will raise an eyebrow: The allegedly injured plaintiff who lives and works on the West Side drives himself to the South Side to see a chiropractor -- three or four times a week -- for treatment. And why did the plaintiff chose this particular practitioner? He was referred, he'll say, by a friend. And who -- he'll be asked -- is this friend? But he won't remember the name. But there are legitimate "soft tissue" cases -- and I would hope that lawyers, insurers, judges and jurors could keep this in mind and evaluate each such case on its merits. It's just that, in the modern climate, legitimate soft tissue cases are prohibitively expensive to prepare and try. Third in a series inspired by the U.S. Chamber of Commerce's charges that "Illinois has one of the five worst legal climates in the nation." Prior entries here and here. The Chamber of Commerce folks would probably agree that "soft tissue" cases are often "frivolous." Certainly a lot of them are -- and it's nothing new. Go back and read the old Sun-Times series, "The Accident Swindlers" -- a Pulitzer finalist in 1981 for Pam Zekman, Gene Mustain, Gilbert Jimenez, Norma Sosa, Larry Cose, Patricia Smith and John White. The insurers clamped down on these cases after the "Accident Swindlers" series; by the 1990's a couple of major insurers were suing attorneys and doctors and chiropractors on RICO theories because they thought them guilty of conspiring to fabricate or at least inflate damages in "soft tissue" cases. But flimsy soft-tissue cases still exist. I know this because I get calls at my office at least once a month from 800 numbers asking if I'm "interested in handling personal injury cases in Illinois." (Somebody must be responding to all those lawyer commercials on daytime and late night TV.) I also know this because I sit as an arbitrator in the Cook County Court Annexed Arbitration Program several times a year and I see them. It is well documented that lawyer-arbitrators have been more generous in these cases than juries -- yes, even in Cook County, even though the Chamber of Commerce or the American Tort Reform Foundation types are certain that the typical Cook County juror is just itching to hand out large stacks of corporate money. I would argue that the biggest single reason for the discrepancy in damage awards is Supreme Court Rule 90: More often than not, the arbitrators hear difference evidence than the jurors. In the same case. In arbitration, if a party complies with the notice requirement of Rule 90(c), all sorts of documents are "presumptively admissible... without foundation or other proof." But Rule 90 does not apply at trial: Medical records and bills that are automatically admitted at arbitration may never see the light of day at trial. It's pretty easy to see why a proceeding where the bills are in evidence will result in a bigger award than a proceeding where the bills are not. In December 2003, Rule 90 was amended to require a plaintiffs to specify whether their medical bills are paid or unpaid. In general, when evidence is admitted in a personal injury suit, by testimony or otherwise, that a medical bill was for treatment rendered and that the bill has been paid, the bill is deemed prima facie reasonable. The idea is simple: People don't pay for what they don't need. I'm guessing -- because, in my experience as an occasional arbitrator I see 90(c) packages which do not specify whether the proffered medical bills are paid or unpaid -- that defense counsel are not routinely moving to strike 90(c) packages which fail to make this clearly required delineation. The Supreme Court has stated in a number of contexts that its rules "are not aspirational. They are not suggestions. They have the force of law, and the presumption must be that they will be obeyed and enforced as written." Roth v. Illinois Farmers Ins. Co., 202 Ill.2d 490, 782 N.E.2d 212, 215 (2002), quoting Bright v. Dicke, 166 Ill.2d 204, 210, 652 N.E.2d 275 (1995). See also, P.R.S. International, Inc. v. Shred Pax Corp., 184 Ill.2d 224, 703 N.E.2d 71, 76-77 (1998), and Robidoux v. Oliphant, 201 Ill.2d 324, 775 N.E.2d 987, 991 (2002). I would therefore assume that such motions, if made, would be favorably received. That still won't close the gap between what arbitration panels award in "soft tissue" cases and what juries award -- because the arbitrators will still see the bills, although they will feel more free to disregard unpaid bills as not "reasonable" -- but I'll bet it would narrow it. To the extent that the rule is being followed (and it is, but not always), I would venture to predict that the gap has already been narrowed from the wide discrepancies noted only a few years back. Enforcement of the rule would surely hold down awards in many "soft tissue" cases -- the bills are seldom paid. The point of this lengthy example is to show that rules matter. It's not that arbitrators are "liberal" and Cook County juries are not, it's that the two groups often reach different results in the same case because they consider different evidence, not because of some partisan approach. Different rules apply; different results obtain. When the U.S. Chamber of Commerce or the American Tort Reform Foundation decries "liberal" judges, they do both the judges and the public a disservice. What these groups are really exercised about are, more often than not, rules or statutes. That should be the focus of their efforts. But then they'd have to admit they're lobbying.